Ignition Edge MQTT by Cirrus Link is software that turns virtually any embedded PC or field device, such as an industrial PC or even a Raspberry Pi, into a lightweight, MQTT-enabled, edge gateway¹ that works seamlessly with Ignition IIoT and Sparkplug enabled applications. It is an affordable, lightweight, limited version of Ignition with its tools and environment supplied with the MQTT Transmission Module targeted for the edge providing the connectivity to data from PLCs, RTUs and other sensors. 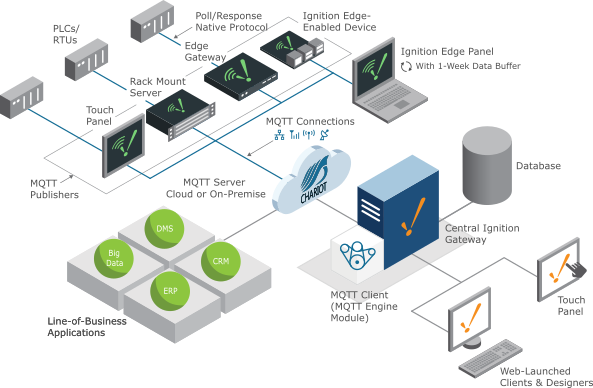 Ignition Edge MQTT uses the highly efficient MQTT protocol to transmit data to any MQTT broker and supports the open source Sparkplug data-encoding topic and payload specification. Ignition Edge MQTT turns any device, touch panel, rack-mount server, or client terminal, into an edge gateway, with unlimited tag support. Edge MQTT converts data from connected PLCs and RTUs into MQTT and publishes it to an MQTT broker in a way that can be easily received by the MQTT Engine Module. Ideal for OEMs: Embed features such as HMIs, alarming, OPC-UA, with unlimited tags and up to one week of data history. For easy PLC connection, all Ignition Edge products come with unlimited tag support and are equipped with OPC-UA along with the one protocol driver that can be Modbus, Siemens, and Allen-Bradley suite of drivers. Other drivers supported by Ignition, such as DNP3, are available to add onto Ignition Edge products for an additional cost. There are two other Ignition Edge software products that can be mixed and matched in any combination with Ignition Edge MQTT². These are Ignition Edge Panel and Ignition Edge Enterprise. Adding the Ignition Edge Panel software component provides an embedded HMI functionality with robust Ignition features. Features include, one local client, one remote web client for mobile access, and alarming features including email notification. The Ignition Edge Panel includes a client fallback feature for mission-critical applications requiring fail safe measures. The Ignition Edge Enterprise offers local data buffering³ functionality at the edge of the network, with a limit of up to 500 tags. If a network connection between Ignition Edge and the central Ignition server (with EAM installed)4 is severed, Ignition Edge Enterprise will continue to collect historical data for up to one week. When the connection is restored, Ignition Edge Enterprise will synchronize data back to the central Ignition server to maintain data integrity. For tutorials and support on using the MQTT Transmission Module with Ignition Edge MQTT, please go here. The MQTT Distributor Module and any server compliant with the 3.1.1 MQTT protocol OASIS standard. Ignition is compatible with any Java SE 8-enabled OS. Full support is only offered for listed OSes.